Add craftsmanship to your collection. Each of the replica's 587 parts is individually designed, cast or fabricated...then hand-assembled using tweezers, glue-filled syringes, and a steady hand. Materials are chosen to replicate each feature accurately and include stainless steel, high-def resin, brass, wire, rubber and other composites. A Gem for the Emerald City. Fairfax County's T429, a Pierce Velocity 100' Tiller, is one of our most complex projects to date. Our goal with each release is to improve in every area...so that our customers will notice something new each time they view the model. Best 1:50 Scale Truck by Toy Trucker & Contractor. 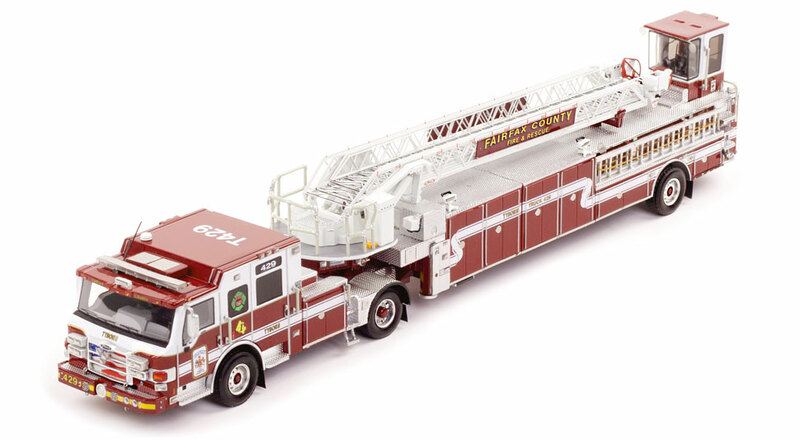 Tyson's Truck 429 features the 1:50 scale industry's first 0.6mm stainless steel ladder, making it a true-to-scale replica. Countless hours of design, proofing, and improvements were invested over 16 months, ensuring that this replica would be museum grade and award-winning. Exclusively limited to 350 units. Fire Replicas are designed with the elite collector in mind, and manufactured in limited quantities to enhance future value. Fairfax County's T429 will be the flagship for only 350 discerning model collectors. An impressive TDA deserves a stunning presentation. T429 measures 14.5"L x 2.5"W x 3"T and is securely displayed inside a custom case. The case dimensions are 18"L x 6"W x 5.25"T and the platform includes an etched stainless steel nameplate with the Fairfax County seal, department and truck name. Multi-materials including High Def Resin, wire, stainless steel, rubber and other composites. Functionality includes rolling wheels and pivoting 5th wheel. This Fairfax County Fire and Rescue Department Tysons Truck 429 scale model is a museum grade replica. Like all Fire Replicas models, every detail is modeled to perfection and with razor sharp precision. The replica features the specific department configuration and graphics, leaving no detail overlooked. The display case is custom manufactured with high quality acrylic and resin. The stainless steel etched plate features the department name and seal, and the truck name. This replica is a treasure to be displayed and admired and is in no way a toy. When it comes to highly detailed and realistic models, Fire Replicas has once again delivered with a stunning representation of the in-use Tysons Truck 429 from the Fairfax County fire and rescue department. Based on the Pierce® Velocity® chassis, this tractor drawn aerial is fitted with a 4-section 100’ ladder and powered by a Detroit DD13 engine delivering 500hp. The model has an impressive size, measuring 14.5” x 2.5” x 3” and has been constructed from 587 individual parts in high def resin, wire, stainless steel, rubber and other composites which result in a museum quality replica exacting in every detail to the original. As with the other models in the range, the custom packaging consisting of a fully lined base with Perspex cover and photo-etched name plate depicting the department and truck name. The tractor unit has a pronounced front grill with the stars & stripes flag graphic placed behind the chromed frame with a textured diamond plate finish on all standing areas. Clear and tinted plastic lenses for the lighting are used to good effect, as are the various grab handles located along the sides of the body. The clear front and side windows allow for glimpses of the interior, where the grey finished surround encases the driver’s station. You can also make out the crew seating in the rear of the cabin. The rear chassis has a number of compartments, with the door frames accentuated with silver pin lines and photo-etch door handles which really do look the part. The design allows for storage of extension ladders on both sides and even here, attention to detail is spot on. Access to the tiller cabin is to the rear on the left side only, and the access steps are textured with grab rails finished with silver joints for total realism. The tiller cabin has a fully finished interior with both clear and tinted windows fitted to the frame. Even here, exacting details include the photo-etch screen wiper, grab rails and a number of small lights, all expertly installed. One of the most interesting aspects of the replica is the way the ladder has been constructed. True to scale, the thickness of the stainless steel ladder sections is an impressive 0.6mm with a water tube running along the underside, terminating with the spray nozzle at the tip of the ladder which has orange painted hand rails. The platform to which the ladder is attached has tiny safety chains and railings which all have the joints painted in silver which again shows the exacting levels of realism. The application of the white stripes along the sides of the model is flawless with a number of tiny safety and instructional labels located throughout the model, even the extension markings have been printed onto the ladder while the Tysons Corner and Fairfax County emblems are accurately replicated on the sides of the tractor. The Fairfax County Fire and Rescue Department trains firefighters and paramedics to provide a full complement of fire suppression, technical rescue, swift water rescue, hazardous materials, and emergency medical services, including basic and advanced life support and emergency medical transportation–it is a career and volunteer all-hazards department. Since its humble beginning in July 1949, the Fairfax County Fire and Rescue Department has evolved from ten skilled “drivers” to a complex agency responsible for meeting the emergency needs of over one million residents. Today, more than 1,330 uniformed men and women operate from 38 fire and rescue stations strategically positioned throughout Fairfax County. Additionally, about 170 full-time civilians provide key support functions from headquarters and other locations. The Fairfax County Fire and Rescue Department operates on three separate 24-hour rotation shifts. Each shift is led by a Deputy Fire Operations Chief. The county is separated geographically into seven battalions, each managed by a battalion management team of a Battalion Fire Chief and EMS Captain. Fire suppression personnel and paramedics work in tandem to ensure the highest level of safety and care possible for the residents of Fairfax County. Tysons Corner or Tysons is a census-designated place and unincorporated community in Fairfax County, Virginia, United States. Located in Northern Virginia between the community of McLean and the town of Vienna along the Capital Beltway, it lies within the Washington Metropolitan Area. Home to two super-regional shopping malls—Tysons Corner Center and Tysons Galleria—and the corporate headquarters of numerous companies, Tysons is Fairfax County's central business district and a regional commercial center. It has been characterized as a quintessential example of an edge city. The population was 19,627 as of the 2010 census. This is a large very detailed model. Has a lot of the minature warning lables. Has all the appropriate warning lights. It has the fifth wheel pin also. The tiller cab is very detailed as well with mirrors and seperate windshield wiper. There are many more details....like the ladder scale on the ladder. Fire Replica's recent holiday promotion made this one too good to pass up! Comparing the model to numerous photos of the real one online, they have captured every detail to perfection once again. I am happy to have this tiller in my collection along with the Kern County unit - both are winners! This is now my second TDA from Fire Replicas, the details on the Fairfax ladder are great, the decals on this truck add to it character. Thanks for doing the TDA's they really are sharp looking. Superb workmanship. This model is a delight to display and has become a talking point with visitors (considering I have over 200 fire appliances in my collection, that says something). Only problem with the model is deciding whether to display it in its display cover or among my other models. Overfilling the shoes of previous Fire Model Manufacturers! I have been an avid collector of Fire / EMS models since I was very young, and am absolutely thrilled with this model. There really is nothing else that compares to the amount of detail, and craftsmanship that goes into these pieces. I cannot wait to receive all the others I have pre-ordered, and can guarantee that they will rest proudly on my shelves for a very long time. Fire - Replicas, great job! I suggest you consider making gift cards a purchasable item! I reviewed Fairfax County Truck 429 for a major diecast magazine, and for a resin model it's build quality, accuracy, and quality of finish rates on par or better to top diecast productions.The aerial ladder detail far exceeds anything I've seen in any ladder truck in any medium. Most importantly, models of this quality embody a corps d'espy ; big and tough for the Pierce Velocity, sleek, fast and clean for Kern County's Quantum. Beautiful!